It's the most wonderful time of the year, as well as the best time to reconnect with friends and family that you may have lost touch with. Sending out personalized Christmas photo cards is a perfect way to remind someone that although you may not see each other often, they are still in your thoughts. Celebrate the holidays with Polka Dot Design and allow us the opportunity to be your best source for all Christmas photo cards. The best part about choosing us for your Christmas photo card needs, is that with every card you choose, you're able to personalize it as best as possible. Pepper in your personality with every card and photo card. Our designs and details are like no other, with cards riddled in funky chevron prints, candy cane graphics, clip art ornaments, or colorful stockings. No matter the Christmas theme or idea, we have you covered with our personalized Christmas cards. Pulling together the family for a holiday photo shoot may be hard, but it's always worth it in the end. Photo Christmas cards from www.PolkaDotDesign.com are a great way to commemorate the past year and keep annual mementos. These photos always bring joy and light to every friend and family member who receives them, so why not allow Polka Dot Design to help you personalize the greatest holiday photo card yet? Or perhaps you are looking to try something new this year and haven't yet given Christmas cards photo taking a shot. 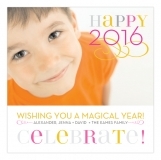 Make this year even merrier with our extensive personalization capabilities. Whether it's a black and white photo with red and green text, or a colorful wreath design adorning the corner of the card, our Christmas selection cannot be matched. Polka Dot Design understands the importance of the perfect Christmas card. It's what recipients keep all year, whether in a box or to hang on their fridge, to honor your family every time they see it. We would love to be the go-to source for all your Christmas photo card needs, and make sure this holiday is merry and bright.